Pipe marking is used to add logos, barcodes, serial numbers and text to PVC and ABS tubes for identification purposes. Pipe labeling is also used to indicate directional flow or identify pipes carrying potentially hazardous substances. The type tube marking used depends on the environmental conditions of the intended application. Harsh environments involving chemicals or extreme temperatures will need a more durable and permanent solution than general applications such as household plumbing. 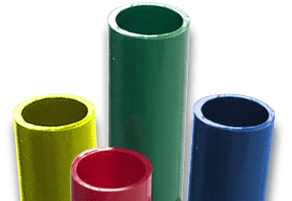 Crescent Plastics offers the plastic ABS and PVC pipe solutions you need, whether you are looking for unmarked PVC tubing or customized pipe labeling. If you are unsure of which pipe marking solution is best for your application, we can help. Contact us for more information. Tube marking is especially important for ensuring workplace safety around piping systems used for hazardous materials. Pipe labeling guidelines for hazardous fluids and water are determined by ASME A13.1 Scheme for the Identification of Piping Systems. These guidelines are a voluntary consensus standard that has not been adopted by OSHA but should still be followed to identify hazardous substances and help prevent accidents and injury. Properly labeled PVC tubing prevents confusion over what substances are contained in a pipe. Proper identification also aids in general maintenance and emergency operations involving redirecting, adjusting or shutting off flow.